On the seventh day of the ninth month in late autumn, a monk traveling in the provinces visits the remains of a Shintō shrine in Nonomiya in Sagano, Kyoto, where a shrine maiden of Ise Shrine purified herself in ancient times. Impressed by the torii gate made of logs and the brushwood fence, which remain as a shadow of what the shrine used to be, he prays at the shrine. Then, an elegant village woman, holding a branch of the sacred sakaki tree, appears and asks the monk to leave the place as she pays a visit at Nonomiya Shrine to recall old days every year on this day and offers a ritual. Asked her what recalling the past means, she nostalgically tells the monk the story of Lady Rokujō, saying that Hikaru Genji once visited the Lady at this shrine on this day. Lady Rokujō devoted herself to purification at this shrine with her daughter, who was to be a shrine maiden serving at Ise Shrine. The village woman reveals that she is in fact Lady Rokujō and disappears. The monk listens anew to the story of Hikaru Genji and Lady Rokujō from another villager and starts to pray to console the soul of the Lady. Then a ghost of Lady Rokujō appears, riding in an ox-drawn carriage. She shares the story with the monk that the group of Lady Aoi, Genji’s formal wife, humiliated Rokujō by having her carriage pushed aside as Rokujō waited for the parade of the Kamo Festival. She asks the monk to pray and save her soul, which is trapped in obsession. Indulging herself in her memory of parting from Genji at Nonomiya Shrine, the ghost of Lady Rokujō dances gracefully and sadly. Still caught by her past emotions, the unrelieved ghost gets in the carriage again and disappears. This is one of the major works of kazura-mono. 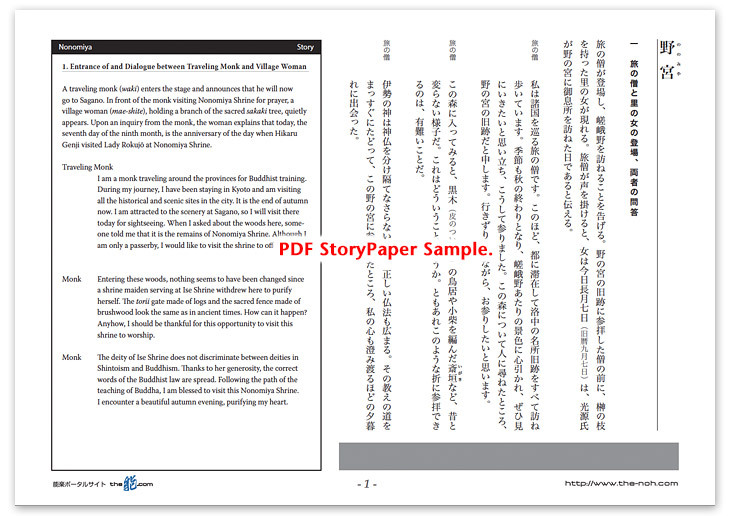 The leading character of this story is Lady Rokujō, a character from The Tale of Genji. In the melancholic atmosphere of autumn in Sagano, this piece elegantly, softly, and gracefully depicts the swell of her emotion, her bottomless wistfulness for the old days and her obsession with sad, painful love. 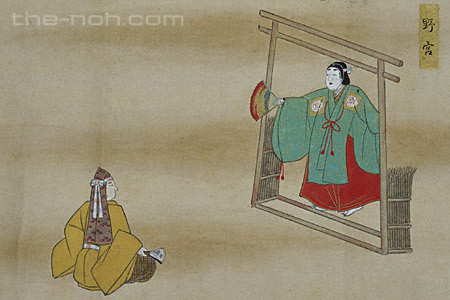 In the Noh drama “Aoi-no-ue (Lady Aoi),” Lady Rokujō is described as an extremely jealous woman, whose soul leaves her body overwhelmed by emotion. However, in The Tale of Genji, she is described as an attractive lady with abundant intelligence and education. Even such an intelligent and noble woman can be tormented by jealousy and obsession at the bottom of her heart when she is placed in lonely circumstances. Through watching this drama, you will be soaked in the feeling of deep suffering and pensiveness that comes from living in this world.